Could a team that wins a Power 5 conference's regular-season title still be a bubble team for an at-large NCAA Tournament bid? That question could be asked about LSU right now as the Tigers are unlikely leaders of the SEC but certainly no lock for the Big Dance yet. A win at South Carolina on Wednesday night certainly will help things for freshman star Ben Simmons' Tigers. This SEC game tips off at 7 p.m. ET on ESPN2. 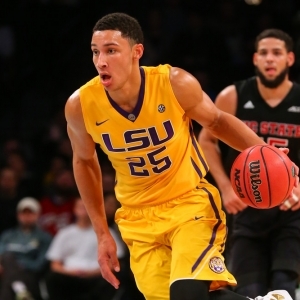 I've said it before and will say it again: the NCAA Tournament won't be as interesting if Simmons isn't in it. But LSU (15-8, 8-2) has more work to do despite leading the SEC by a game over South Carolina, Texas A&M and Kentucky. So we could have a four-way tie by Wednesday night. ESPN Bracketology currently has LSU as a No. 10 seed in the Big Dance. Simmons was named the SEC Freshman of the Week on Monday for the third time. Simmons averaged 18.5 points, 11.0 rebounds and seven assists in wins over Auburn and Mississippi State last week. He shot 61.5 percent from the field. The star freshman in Saturday's win over the Bulldogs was Antonio Blakeney, who had 31 points off the bench. He became just the sixth LSU freshman ever to reach 30 points. Simmons has done it twice. South Carolina (20-3, 7-3) was upset at unranked Georgia last Tuesday but bounced back with an 81-78 upset of then-No. 8 Texas A&M in College Station on Saturday. Sindarius Thornwell had a season-high 25 points with nine assists and six rebounds in the win. That gave USC its first 20-win season since 2008-09, the Gamecocks' first road win against a ranked opponent since 2010 and the first over a Top 10 team since 2006. The Gamecocks made a season-high 12 3-pointers in the game and shot 57 percent from long range. USC has lost three straight to LSU, including in Columbia in 2013 & '14. Key trends: LSU is 2-7 against the spread in its past nine road games. USC is 13-3 ATS in its past 16 at home. This Pac-12 game is at 9 p.m. ET on ESPN2. The Huskies (15-8, 7-4) are another bubble team. They are currently projected as a No. 10 seed for the NCAA. UW has alternated wins and losses over its past six. It was beaten 77-72 at home by No. 23 Arizona on Saturday. Pac-12 leading scorer Andrew Andrews led Washington with 20 points. Dejounte Murray was held to 11 points on 4-for-14 shooting after scoring a career-high 34 earlier in the week against Arizona State. Freshman Noah Dickerson was limited to seven minutes due to an ankle injury, and he's questionable here. Dickerson averages 8.2 points and 5.5 rebounds per game. I still think Utah (17-7, 6-5) is arguably the third-best team in the conference behind Oregon and Arizona, but the Utes were swept over the weekend at the Oregon schools. They were beaten 76-66 at conference-leading Oregon on Sunday. Jakob Poeltl, the Pac-12's second-leading scorer at 17.4 points per game, had 13 points and eight rebounds for the Utes. Utah won at Washington on Jan. 24, 80-75 in overtime. Poeltl scored 29 points and grabbed 10 rebounds as the Utes completed a weekend road sweep of conference games (beating Washington State a couple of days before) for the first time since joining the Pac-12. Andrews led UW with 17 points. Dickerson had 14. Key trends: UW is 4-0 ATS in its past four after a loss. The Utes are 7-2 ATS in the past nine meetings. No national TV for this Mountain West tip at 10 p.m. ET. San Jose State (8-15, 3-8) is the conference's worst team. But the Spartans have won two straight, upsetting both Air Force and Fresno State last week (been off since Wednesday). A two-game winning streak may not sound like much, but it's SJSU's first in conference play in five years. Air Force and Fresno State averaged just 53.5 points, which is 20.5 points below SJSU opponents' average on the season. The Falcons and Bulldogs shot just a combined 31.6 percent. UNLV (13-11, 4-7) got some terrible news on Monday when star freshman center Stephen Zimmerman, one of the top recruits in the country, was ruled out indefinitely with a knee injury. He suffered a bad sprain in Saturday's 111-104 double-overtime loss to Fresno State, the Rebels' third straight defeat. Zimmerman is averaging 10.6 points, 9.1 rebounds and 2.1 blocks per game and is a lock lottery pick in the 2016 draft if he declares as expected. His injury likely will lead to minutes for walk-ons Austin Starr or Barry Cheaney because the team is pondering a medical redshirt for junior Tyrell Green. Less than two weeks ago, the Rebels also lost big man Ben Carter to a season-ending torn ACL. Carter averaged 8.6 points and was second on the team with six rebounds per game. This is the only regular-season meeting between SJSU and UNLV. The Rebels won both last year, including by 34 at home. Key trends: San Jose State is 8-1 ATS in its past nine road games. It has covered eight of its past 10 overall. UNLV is 1-4 ATS its past five games. I'm leaning: San Jose State.